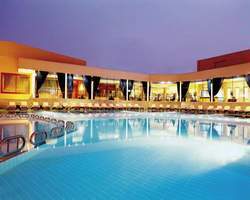 Mövenpick Resort Cairo Pyramids is located on Alexandria Desert Road Giza-Pyramids, 15 km from Cairo city centre, 2 km from the Giza Pyramids, and 35 km from Cairo International Airport. Feel at home and turn your back on the day-to-day routine for a while: Movenpick Resort 240 air conditioned rooms (including suites) satisfy these demands perfectly. All rooms have their own private balcony or terrace, with their modern facilities including interactive TV and internet access. They feature all amenities, which will make your stay with us even more comfortable. 42 sqm room with 2 single beds, far from the main Resort building but close to the banqueting building. Room can accommodate a maximum of 2 adults and 1 child in existing bedding. Extra bed at a charge is possible. Movenpick Resort Garden Suite measures 94 square metres and is located on the ground floor with views to the garden. It consists of two interconnecting rooms: a bedroom with a large double bed and a living room. Each of the rooms has its own terrace and a private bathroom. The bedroom can accommodate a maximum of 2 adults and 1 child in the existing beds. Additional bed available for a surcharge. Business Suite, 83 sqm, located on the first floor. One bed room with queen bed, one living room with kitchenette, a bathroom and a terrace. Room can accommodate a maximum of 2 adults and 1 child. Extra bed at a charge is possible. Family Suite of 97 sqm on the ground floor with garden view. Consists of three connected rooms. One bedroom with a large bed, one salon with sofa and kitchenette and one bedroom with two separate beds. Each room with its private external terrace and bathroom. Room can accommodate a maximum of 4 adults and 1 child in existing bedding. Extra bed at a charge is possible. Mövenpick is a byword for culinary excellence. Movenpick Resort restaurants offer a wide variety of the best cuisines from around the world as well as local specialties, all prepared by Movenpick Resort chefs with the freshest ingredients and meticulous attention to detail. A 24-hour international restaurant serving breakfast, lunch and dinner buffets as well as an à la carte menu throughout the day. International à la carte menu and Italian pizza. Enjoy our famous ice cream menu. Located at the swimming pool. Enjoy the authentic taste of Thailand. Located in the lobby. With a panoramic view over the three great pyramids of Giza, the café serves grilled food, snacks, drinks and Movenpick Resort specialities. One swimming pool (heated in winter), four floodlit tennis courts, fitness centre (all equipment renovated in 2006), sauna and massage, jogging track/football court and children’s playground ensure that there is no shortage of recreational opportunities. Let your stress fall away in our resort.